i love easter. i mean, chocolate bunnies, cadbury cream eggs, warm spring air, flowers, festive dresses and cardigans, yummy food, spending time with family, seeing who can throw eggs the farthest off of the back deck of my in-laws' house (oh wait, that's just MY family's weird tradition? ), jellybeans, easter egg hunts, cadbury cream eggs, cadbury cream eggs... now that i have 2 kids and i get to BE the easter bunny, i really love easter. the majority of what i got was not in the seasonal aisle. she does have a bit of a sweet tooth so she had to get at least a small chocolate bunny and i also got some of those plastic eggs, which i filled with jelly beans and mini cream eggs and chocolates. the rest of the basket (bucket) is filled with things she needs that i know she likes. there is a fancy pink leotard for her to wear in ballet class. there are pajamas (elmo and minnie mouse) to replace some that she has grown out of. there are bert & ernie and abby cadabby toothbrushes, since she is obsessed with sesame street. she is currently potty training so i even included colorful undies tucked in the spaces as well as new yoga pants and sweatpants. 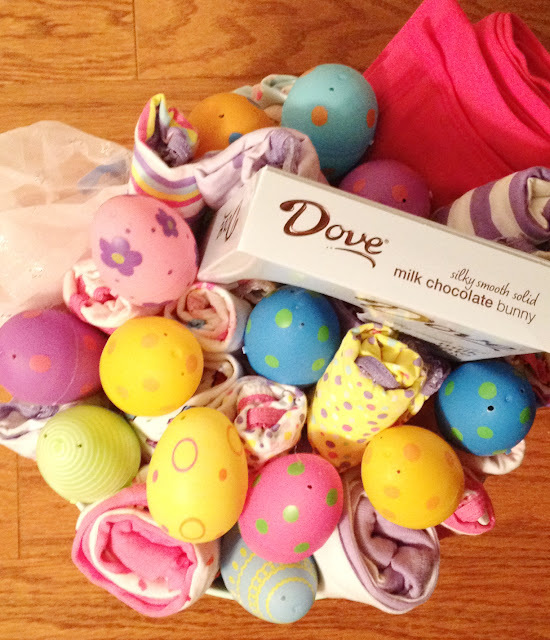 obviously, no chocolate bunny or jelly beans. she LOVES to eat though. so i included baby snacks - puffs, yogurt melts, oatmeal and a few jars of baby food. her older sister loves the muppets and has her own kermit the frog, miss piggy and fozzie bear stuffed animals. 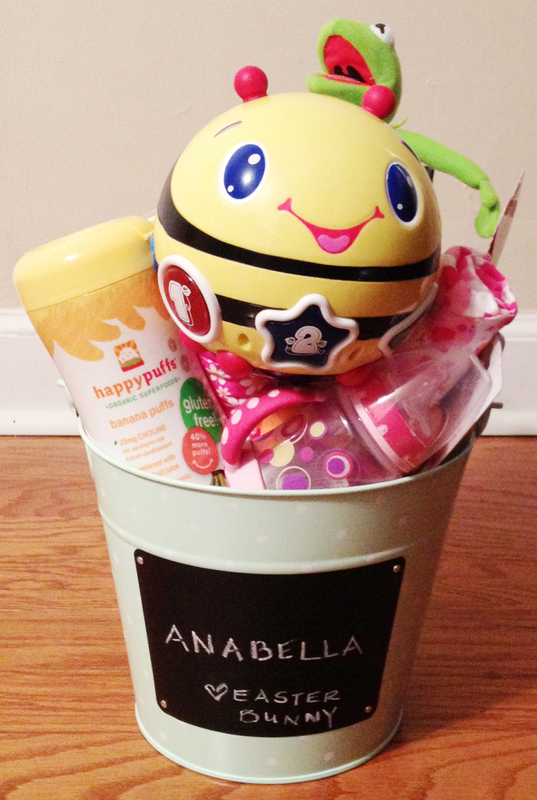 they are both really good about sharing but i wanted anabella to have one of her own. there are some onesies in the next size up, since i know she'll need them. 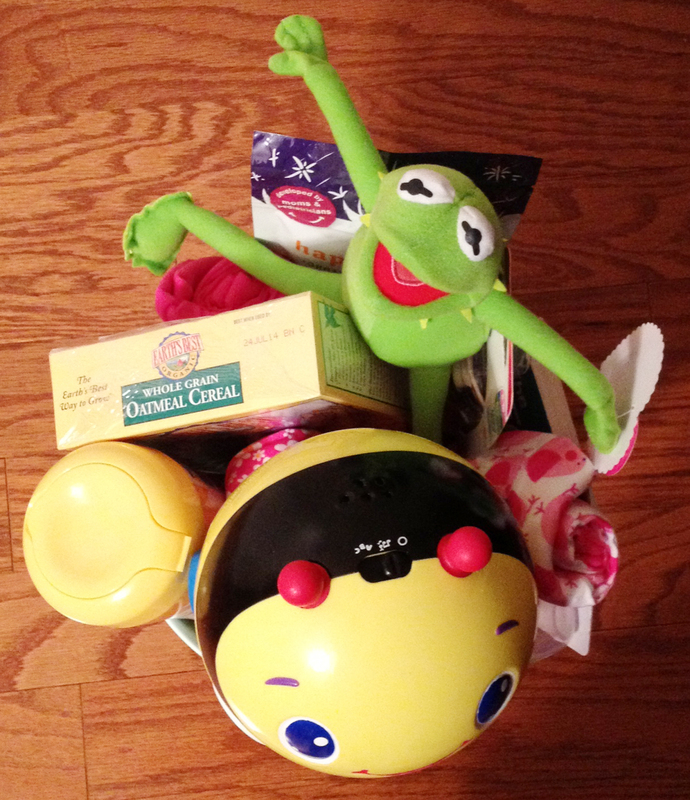 plus, a sippy cup and pacifiers, since we needed more of the ones she really likes. that bee toy plays music and rolls around the floor. we don't have any toys like that already and i'm sure my crazy active girl will have a blast crawling after it and chasing it. i could probably give luciana a dozen pairs of cinderella socks and anabella a cardboard box and they would both be super excited. but i know not everyone's kids are as easy to please as mine. i guess i just can't bear the thought of last minute shopping down those crammed seasonal aisles, fighting over what's left of those junky toys that my kids will break or try to eat. i also think it's nice to make something ordinary (like new pajamas or a snack) into something a little more special. how about you? 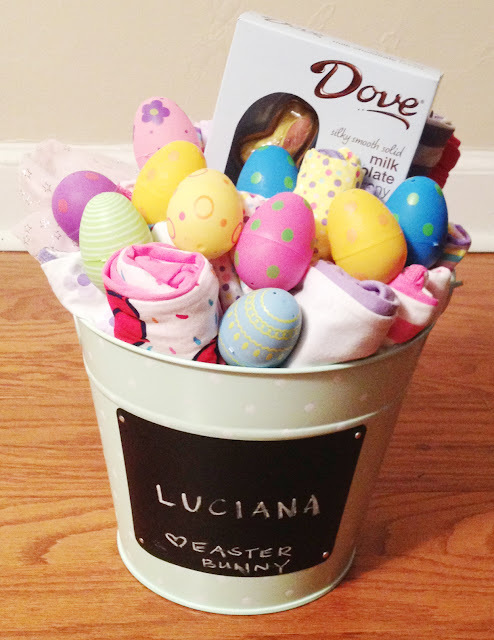 do you fill your kids easter baskets with any unconventional things? what about in your own easter baskets as a kid?